The Tin Fish has been a staple in the Twin Cities since 2004, but, unfortunately, its doors were closed last year. While Stella’s Fish Cafe can never take the place of Tin Fish, we can offer a bounty of unique seafood dishes all obsessively prepared with fresh ingredients flown in several times a week. If you’re curious what to try next time you stop in or order out, check out some of our personal favorites. You just might find a bite that keeps you coming back for more. In the restaurant business, you have to stay on your toes. One minute, the restaurant’s empty and the next, you’re in the weeds. We understand the importance of a quick bite during lunch hour. That’s why we’re big fans of the crispy walleye tacos. We take fluffy, soft flour tortillas, grill them up crisp, the stuff them full of homemade Napa cabbage slaw, marinated veggies, guacamole, queso fresco, and a creamy avocado aioli. It’s a mouthful of flavors and textures that will satisfy, even if lunch is cut short. 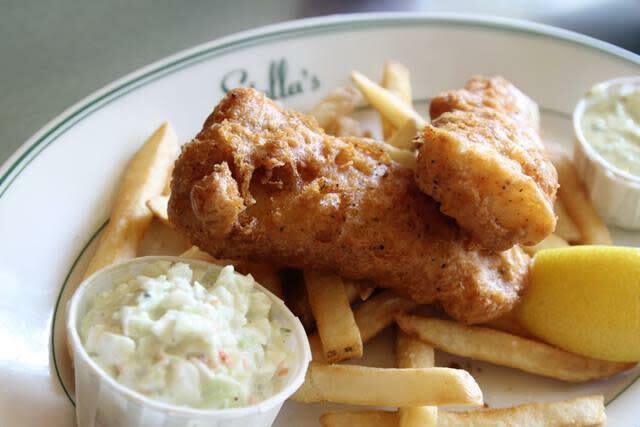 If you’re looking to keep things crispy, crunchy, and casual, Stella’s fish and chips will meet every requirement. We start with fresh beer battered Icelandic Haddock. This fish features a mild flavor and melt-in-your-mouth flaky meat that pairs perfectly with Stella’s dill tartar sauce. Keep it classic with fries or mix it up with garlic chive mashed potatoes. You’ll also get a side of coleslaw and fresh lemon. It’s street food that’s been elevated to fine dining. This time, you’re definitely going to want dessert. We can’t pick just one favorite, and you won’t be able to either. Our deserts are big enough to share, but you probably won’t want to. 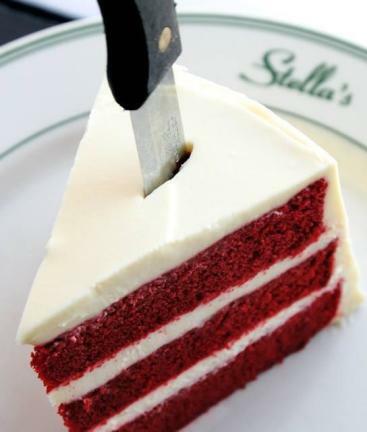 The red velvet cake is three layers of rich, moist cake iced thick with scrumptious cream cheese frosting. It’s a popular classic sure to please. On the other hand, it’s hard to resist Stella’s original Maker’s Mark Bread Pudding. This isn’t your Gramma’s bread pudding. The smoky flavors of Maker’s Mark make the perfect complement to the hearty helping of Sebastian Joe’s smooth cinnamon ice cream. Don’t worry, we won’t tell if you eat the whole thing.